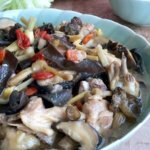 I have been wanting to share more Chinese vegetable recipes, because in every home cooked Chinese meal, having a vegetable dish is pretty much mandatory. 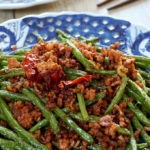 There are so many different Chinese vegetables and so many cooking styles, so cooking daily vegetable dishes does not have to be boring and repetitive. 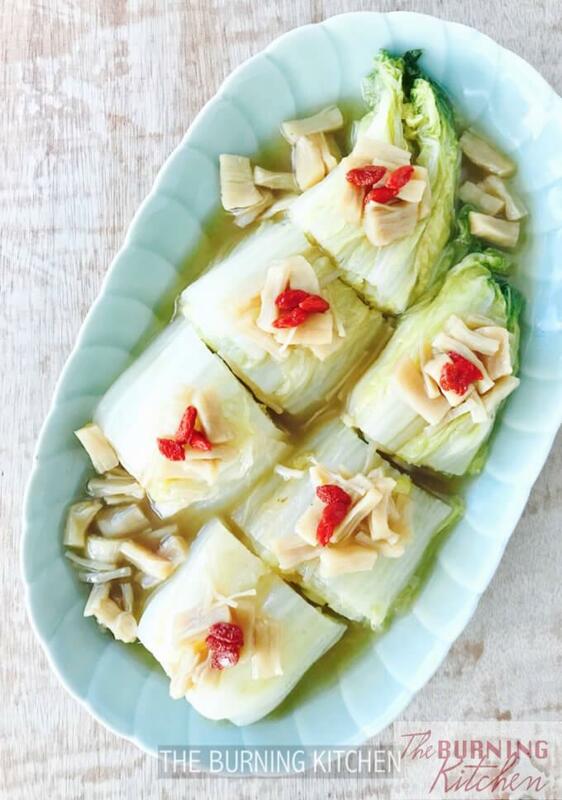 If you simply can’t get enough of the sweet goodness of fresh cabbage, you can also try our recipes for Steamed Cabbage Roll with Minced Meat, Cantonese Cabbage and Mushroom Rice and Chap Chye Recipe (Braised Mixed Vegetables) for more cabbage-y ideas! Today I’m going to feature Napa Cabbage, also known as Wong Bok. 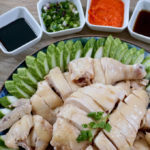 Napa Cabbage is also referred to as Chinese Cabbage, but do note that there are 2 varieties of Chinese cabbage – Napa Cabbage (大白菜 Da Bai Cai, or ‘Big Cabbage’) vs. Bok Choy（小白菜 Xiao Bai Cai or ‘Small Cabbage’). Although the Chinese names suggests that the two are small and big versions of each other, they actually are two different species altogether. 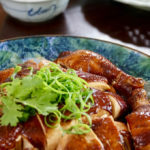 My favourite way is cook Napa Cabbage is to braise it with dried scallops, also known as Conpoy (干白 Gan Bei in Mandarin). The ingredient is usually served as a delicacy in most Chinese restaurants. 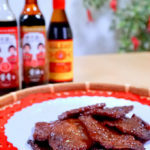 Dried scallops (especially good quality ones) are one of the luxury items that we reserve for special occasions like Chinese New Year and birthdays. Dried scallops are mainly imported from Japan, China, Canada and Vietnam, but they are expensive. 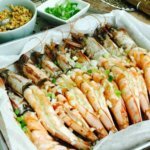 A more economical option is to buy dried scallops that are broken into smaller pieces, especially if the dish calls for the scallops to be shredded up, such as in this recipe. The flavours go well together. 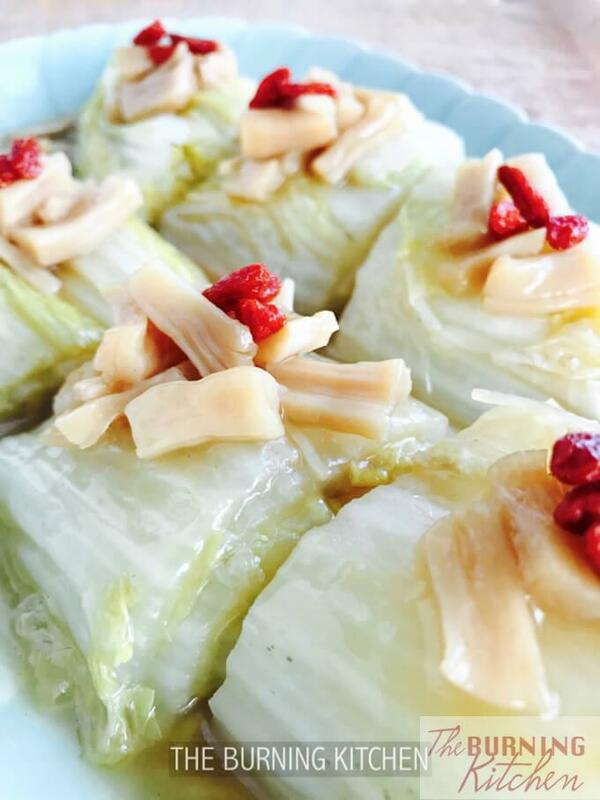 The sweetness of the Napa Cabbage go well with the seafood taste of the dried scallops. The textures of the ingredients go well together too. Napa Cabbage is crunchy, while the dried scallops are chewy, and both give a good contrast to the dish. 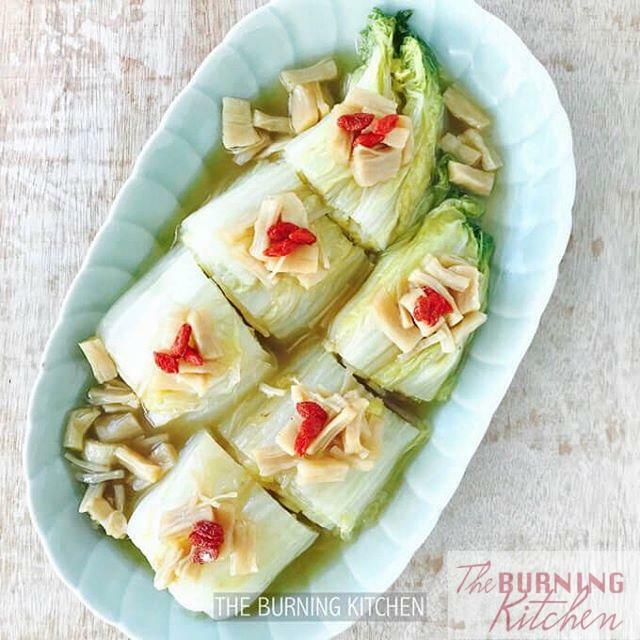 HOW TO MAKE BRAISED NAPA CABBAGE? Wash the napa cabbage and drain dry. Cut into half lengthwise and place on a plate with the cut edge facing down. Rinse the dried scallops and place in a bowl to soak in 300 ml of boiling water and 1/2 TBsp of Chinese wine for about 25 mins. Remove the skin from the ginger and slice thinly. 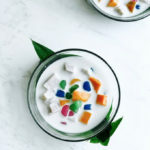 In a bowl mix 1 1/2 tsp of cornflour with 1 tsp of water and set aside. Rinse the wolfberries. Drain dry and set aside for later use. In a wok, add water and bring to a boil. Once boiling, place the plate of napa cabbage in the wok to steam for 20 mins. Meanwhile, put the dried scallop together with the soaking water in a small pot and boil over medium low heat for about 30 mins until the scallops are soft. Turn off the heat. In a wok, add 2 TBsp of oil and heat over medium high heat. Add in the ginger slices and fry until aromatic. Place the 2 halves of the Napa Cabbage into the wok and fry for about 2 mins turning it over once until it is lightly browned and caramelised. Add the water from the scallops as well as the water from the steamed napa cabbage to the wok to deglaze the wok. Allow to simmer for about 5-10 mins. Add in salt and oyster sauce to the glaze and mix well. Transfer the Napa Cabbage onto a serving plate leaving the sauce in the wok, then cut into sections of about 4 cm wide. Add all the braised scallops into the sauce and boil over medium heat. Add the wolfberries to the sauce. Thicken the sauce with cornflour mixture. (Give the cornflour mixture a stir before adding). Pour the sauce and the scallop over the Wong Bok and serve hot. Choose Wong Bok with light yellow coloured leaves instead of those with green coloured leaves as they tend to be sweeter and more tender. Buy Su Choy if you can. 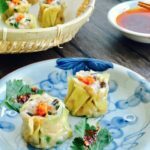 The elongated version of Wong Bok known as Su Choy also tends to be more tender and sweeter than normal wong bok, but its may not always available. Always look at the base where you will find a hard round centre portion. Wong Bok with a large hard centre portion tends to be fibrous, so its best to avoid those. 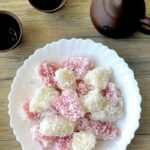 Get dried scallops from reputable shops. There are many types of dried scallops. Some scallops are very chewy while others are tender after braising for abut half an hour. There are also fake dried scallops. 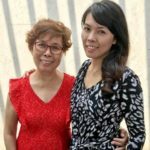 Its best is to get them from reputable shops which provide a certain level of quality control. When choosing dried scallop, smell it. 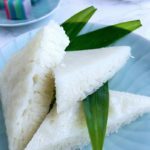 It should give a sweet umami fragrance. When you squeeze it, it should remain intact and not fall apart easily. The colour of the dried scallop should be vibrant orange. Do not add too much salt to the gravy. Dried scallop has a rich sea salt flavour which is transferred to the water after soaking. This is the essence of the scallop that is added to the gravy or soup. As it is already salty, taste the gravy first before adding any salt. Don’t throw away the water from the Napa Cabbage. After steaming the Napa Cabbage, it will release some water which is sweet and to be reserved for the gravy. The Wong Bok is fried in the wok to allow the natural sugars to caramelise and form a glaze that will become the sauce for the dish. Gluten-Free: Use gluten free condiments. 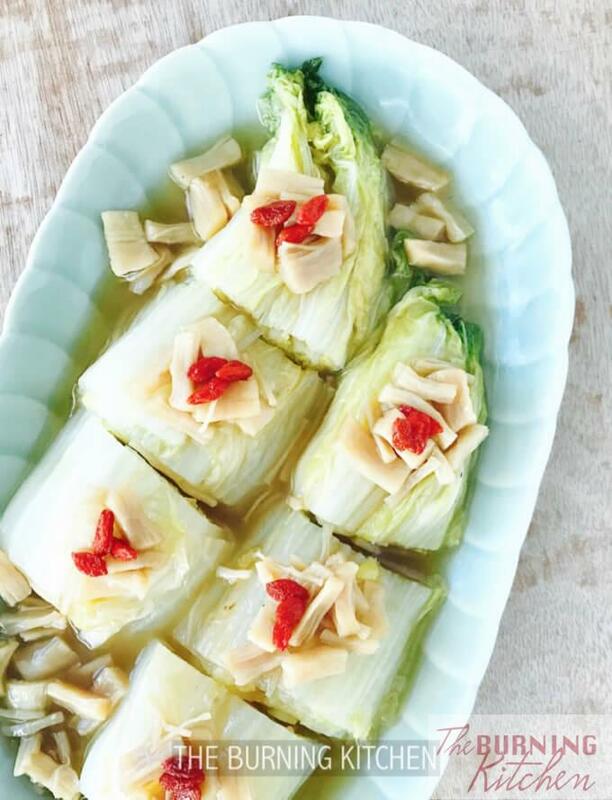 Napa Cabbage (Wong Bok) with Dried Scallops is a light healthy dish with the sweetness of vegetables combined with the taste of the sea. A treat for your tastebuds! Click and see how to whip up with this flavourful dish. Don't throw away the water from the Napa Cabbage. After steaming the Napa Cabbage, it will release some water which is sweet and to be reserved for the gravy. The Wong Bok is fried in the wok to allow the natural sugars to caramelise and form a glaze that will become the sauce for the dish.